Ah Europe…the source of so many of our very best jazz films. Dizzy with the Kenny Clarke-Francy Boland Big Band filmed in Denmark. Jazz first hit Denmark in 1923. During the Nazi occupation jazz was viewed as a symbol of resistance and a home grown jazz scene actually flourished much to the impotent consternation of the Nazis. 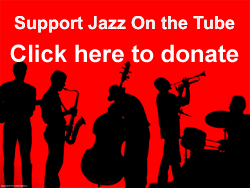 Jazz on the Tube has an entire section devoted Cuba and its music. Want more insight into Cuban jazz?